Landscape design artist Rick Silkey is an expert not only in the artful arrangement of hardscape and softscape elements of an outdoor living space but also in the science of landscaping. He understands the native vegetation and soils of the desert region on an intimate level. 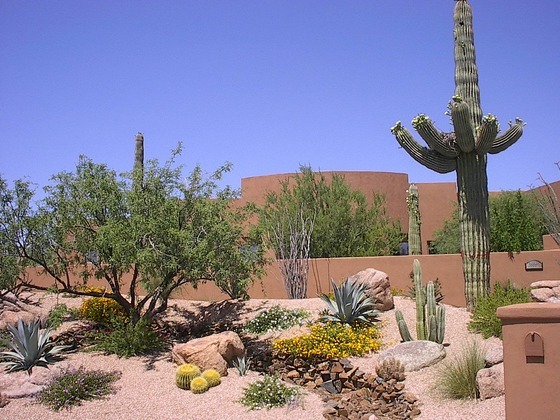 It is this thorough understanding of Arizona native plants that allows him to take full advantage of the natural beauty of the region in providing homeowners with yards and gardens that perfectly complement their lifestyles and their properties. Arizona native plants provide excellent touches to low-maintenance, water conserving landscapes that thrive year-round. Ultimately, Arizona is the place that you have chosen to call home. Why wouldn’t you want your yard or garden to complement and encapsulate the native beauty of the region? Landscaping isn’t a simple matter of arranging native plants into a pleasing design. Not all native plants will grow in all native soils. Just because a plant thrives in one part of Arizona doesn’t mean it will thrive in your yard or garden. Rick Silkey takes into consideration soil type, the sun and shade requirements of certain plants, pH, and how much water certain plants require before planting. The right combination of native plants, possibly augmented by artificial grass or hardscape accents, can make all the difference in how you perceive your outdoor space and your level of satisfaction with your landscape. The wrong combination, on the other hand, may look all right for a little while, but will end up costing you time and money. 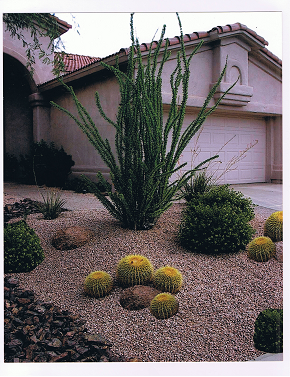 Ultimately, the appearance of your yard or garden is not limited by using Arizona native plants. It’s empowered. If you would like to learn more about how you can bring your outdoor space to life by using Arizona native plants, please contact Rick Silkey today.